Things I liked: I zeroed scope and and shot at a 15 yard target first two days. On third day, I took my .22 wood Marauder on my ranch hunting, I anchored 3 ground squirrels (all at 15 to 20 yards away). I found I had hit exactly where I had aimed. I then overlooked my canyon and saw a ground squirrel about 40 yards away in the top of an old hollowed-out oak tree. The wind was blowing hard from the north west. I sighted in 1" to the left of the squirrels upper shoulder and released the trigger. The ground squirrel dropped. When I reached the dispatched ground squirrel and saw the pellet had done its job exactly where I had anticipated. I then went down a trail I had made at the bottom of the canyon. Soon I saw two more ground squirrels. I took aim at the one on the left,and dispatched it too. I took squirrels to my meadow for the ravens to eat. This rifle is better than I expected. The wood stock with black cheek riser, is much more accurate than my .22 using cb shorts. Rifle handles like a shotgun. Things I would have changed: Rifle shroud and air reservoir appears to be painted rather than blued. I suspect it is because shroud is aluminum. Better rifle gauge as mine doesn't work reliably, however Crosman is going to replace it. I am using only the gauge on Benjamin pump until the new gauge arrives Quick disconnect on Benjamin pump is giving me problems and Sun Power is sending me another. Kudos to both of them. Is this rifle accurate, quiet, well built, worth the money, heavy, does it have a great looking solid feeling beautiful wood grain stock like the picture? Yes, yes, yes, yes, yes, and yes! Would I recommend this .22 cal in wood stock instead of a .22 powder burner for dispatching ground squirrels without breaking the sound barrier? Yes! Was the Benjamin pump easy to operate with very little sweat for a 64 year old weighing 167 lbs. (takes 2 to 2 1/2 pumps per shot). I see no need for a scuba tank. Would I recommend Pyramid Air with their good prices and excellent satisfaction policy? Yes! What others should know: The following strings of 10 shots each from a single charge were mostly hole in hole and all 60 shots (6 strings)were able to be covered with a penny. Here are the 6 groups chronograph-ed with 1 full charge from Benjamin pump to 3000 psi. This with no adjustments to the rifle. Using Crosman Premiere 14.3 domes, here are the velocity of the 60 shots. String 1...860, 860, 865, 872, 866, 877, 864, 876, 882, 883: String 2... 881, 895, 893, 889, 880, 893, 902, 892, 891, 895: String 3... 896, 902, 898, 904, 900, 896, 902, 903, 902, 907: String 4... 907, 903, 900, 903, 902, 906, 901, 900, 892, 891: String 5... 888, 892, 889, 886, 884, 882, 879, 877, 873, 865: String 6... 865, 858, 855, 853, 847, 842, 838, 836, 830, 823. Don't lean against wall like a powder burner due to the free floating barrel. I canceled a pre-order of an NP2 due to delays and early reviews. Almost triple the money for .22 cal wood marauder. "Totally worth it to me." Awesome wood stock demands extra special care. Things I liked: Very accurate, great trigger, compact. Things I would have changed: Bolt not smooth. What others should know: I can't give a full review yet. I am waiting for my third .25 cal Benjamin Marauder. The first gun had shipping damage. The second gun worked really well for about 4 or 5 mags then malfunctioned. I had to return it. My original gun arrived 7 Dec. The next one arrived Dec. 30th. Who knows when the 3rd and hopefully last one will get here. Things I liked: The gun is very accurate, easy to load, and fun to shoot. What others should know: Its a great gun. You will be happy with this gun. Things I liked: The gun is one of the best pellet guns I own now. This gun is very accurate and shoots great. What others should know: Try this gun it is great. Things I liked: This is an extremely accurate rifle and in terms of precision has nothing to envy to high-end rifles (I consider this rifle is mid-range). It also has many configuration options. The fact of being such a popular rifle gives an advantage that others do not have and is that there is much information about this rifle on the internet, there are entire forums dedicated to it and there are many modifications available. Things I would have changed: It is very heavy, at least in wood, it is not a good option if you are interested in spending a lot of time walking in the forest, it becomes difficult to walk with it after a while (the synthetic version could be better option for these cases). The stock is ugly, in my opinion it looked better in the first generation. What others should know: I had bad luck with this rifle, the first one came with a leak in the air tank, pyramyd quickly resolved it by sending me a replacement. In the second rifle the magazine was somewhat weak and did not rotate correctly, this was adjusted by squeezing a bit the spring of the magazine. This is an excellent rifle for any use, from hunting to practice shooting, although the price is a little high you will not regret buying it. Things I would have changed: Test each rifle for air leaks as I had trouble with this rifle retaining air pressure. Things I would have changed: Only thing to change is the 11mm rail. Picatinny rail should be standard. Things I liked: Unbelievable accuracy in the 25 caliber model. Things I would have changed: Its weight is up there and becomes difficult to carry around after an hour or so. What others should know: Get it all set up and tuned as best as can be done around 875 fps and 2800 psi fill pressure. This is where I found the greatest accuracy/fpe/range combination. I'm reaching out to about 75-80 yards in fairly windy conditions and still maintaining great accuracy with this rifle. Every time I use it I'm amazed at how well it shoots. I don't have another rifle brand to compare it with, but my experience with the Marauder 25 cal has been better than my expectations and any reviews I've seen online. Maybe I just got lucky or maybe Crossman just produces one very good product... whatever the case, this is my experience with this rifle. Things I liked: I love my .22 cal Benjamin Marauder. It is my go-to air rifle when I want to shoot anything from between 20 to 75 yards. I get 20-30 quality, consistent shots at approximately 910 f/s (26.5 f/lbs) using .22 cal JSB 14.35gr pellets. I also use a Leapers/UTG 4-16x44 AO Swat Mil-Dot 30mm scope with it. The combination of the two gives incredible accuracy. I love that its a 10 shot repeater! Things I would have changed: I guess a little lighter in weight would be nice, but thats a function of the scope as well. The weight of the gun plus the scope is around 11 pounds. That can get pretty tiring after a while. What others should know: I own a lot of pcp air rifles...several Airforce (Condor SS, Talon SS, etc), Hatsan (Bullboss QE, AT44-10 Long QE, etc) air rifles, and I love them all, but this is my go-to air rifle! Things I liked: Very accurate rifle. Great trigger. Although being rather heavy, it's very well balanced and feels good in the hand. Things I would have changed: The cocking design. Bolt lever with the spring tension needed for the .25 caliber is quite heavy. Can get used to but must be careful to fully engage the hammer or a second attempt could double load a pellet. What others should know: Well worth it's price. Things I liked: This rifle is real accurate, if you tune it right for the right pellet and the right application. I can shoot dime size groups at 50 yards on a calm day. I have taken 2nd place in hunter field target in my last two matches against a field of Daystates, Steyrs, and TM1000s at my local air gun club. The trigger is great when adjusted to your preference. I am shooting 55 good shots with JSB/AA 10.3 gr pellets at 890 fps, with an extreme spread of 11 fps over the shot string. The adjustable cheek piece works great. Things I would have changed: The finish of the stock looks cheap and is not durable. I had to refinish the stock after one year. The ergonomics of the stock are not good for me, since the pistol grip is too narrow for my long fingers. The trigger pull weight in the stock configuration is too heavy for field target applications, but it does break crisply at 1.5-2 lbs. I also had to replace the barrel twice before I got an accurate barrel.The first two barrels had some nasty burrs in the breach that caused my pellets to scatter like a shot gun. What others should know: It took me a year of tinkering with my Marauder before it shot competitively in field target matches. This gun is highly tunable and there as many after market upgrades that tune this rifle into a highly competitive rig. Tuning this rifle can be a little intimidating, but well worth the work. Things I liked: BP1763 bought 2/2013 updated to 1764 5/5/18 - A Beauty BACKGROUND The BP1763 with Leapers UTG 30mm SWAT 3-12X44 AO is a predecessor of the current BP1764W. On May 5, 2018 I replaced the valve assembly 1764-100. I get about 40 shots per fill to 2750 PSI. Tech specs say 30. I appreciate this rifle enough to attempt the valve assembly 1764-100 replacement above. Learned a lot and worth the effort. 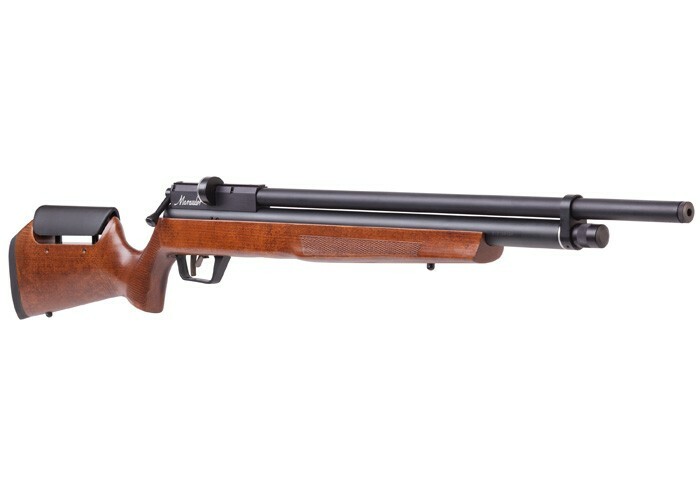 REVIEW OF BP1763 with latest Valve Assembly 1764-100 May, 2018 See detail review at Crosman website:: https://www.crosman.com/marauder-rifle-wood-stock BP1763 2/2013 updated to 1764 - A Beauty (Crosman does not date review. I submitted May 5, 2018) I have put this rifle through its paces at an Appleseed Shoot in North Berwick Maine on September 12, 2015 and reached Rifleman classification with the BP1763 (original valve) - a unique accomplishment with a pellet gun and a testament to BP1763 quality. See Crosman review for pictures of scuba tank and rifle at the firing line. My wife thinks the rifle deserves “Protector of the Garden with Oak Leaf Clusters. The rifle is our honorary top garden tool. To all at Crosman - Nice job. What others should know: Invest in a scuba tank and a two wheel dolly. As painful as it is, a scuba tank gauge ($100 +) is helpful to determine the tank internal pressure when you will need to refill scuba tank. Yes, I did choke down a tank gauge. Gulp,. The Crosman K Valve adapter for scuba tank does not measure internal scuba tank pressure. I will step up to a 4500 PSI carbon tank (CT) to reduce weight. Getting older but not stronger. My existing Crosman adapter hose is short. I am working with a local dive shop for a longer adapter hose for the CT. I need to do some more work here for cheapest method to measure carbon tank internal pressure to determine when to refill CT. Things I liked: Extremely accurate out of the box, shooting at a water bottle lid i was ablle to put 18 of 20 pellets in the lid at 30 yards. Have not shot past 30 yards yet. Other reviews i saw made it seem like the .25 caliber was really loud, I have not found that to be the case. Trigger is nice and smooth and there zero recoil. Things I would have changed: I wouldnt change a thing with my marauder. I have put around 100 pellets (JSB Exacts) and have had zero issues. What others should know: Can easily be used as backnyard plinker. At 30 yards i set my gopro right below the target. I cant hear the rifle when i shoot but i can hear me cycling the bolt to chamber the next round. I find i get around 18-20 shots to a fill before i see a drop off in accuracey. Things I liked: After sighting in the rifle I have yet to miss a critter that has been foolish enough to provide me an opportunity. This is a very accurate rifle that allows me to execute head shots for very quick kills. The rifle (chambered in .177) is very quiet and suitable for urban settings. Basically, you hear the impact of the hammer on the valve (a low-level ping) followed by the wap of a pellet on target. The sound level is much lower than a typical spring operated break barrel rifle and is much more enjoyable to shoot as the recoil is predictable and very easy to manage. Unless someone is on full alert and trying to locate you the report of a shot will go unnoticed. Squirrels and rabbits are easily dispatched with a 177 pellet with the pellet sometimes passing completely through the skull of a squirrel. Rabbits stay where they drop so you don't run the risk of them wandering off to be found by a someone else. Things I would have changed: For my scope, I went with a 56mm diameter objective lens with appropriately high ring mounts and the range of adjustment on the pad for my cheek is insufficient. The gun is pretty massive and is both bulky and heavy to carry. However, this does make for a very stable platform when shooting from a supported position. If you are going to be taking a fixed position ( I use my kitchen window that overlooks the garden) and waiting for your target to come to you the weight will work to your advantage. If you are going to be stalking your target and moving through the terrain be prepared for the weight. What others should know: For years I tried to get acceptable accuracy from a break barrel rifle but could never overcome the effects of having the barrel on one side of the hinge and the optics on the other. I used the iron sights until my eyes lost the ability to focus on the sights and the target. Shooting a break barrel rifle was not a pleasurable experience between the loud and obnoxious "sprang" of the shot and the number of missed shots. I was reluctant to enter the realm of pcp due to its cost but am very pleased I finally made the jump. Skip the effort to get a hand pump ( you will find it to be a frustrating experience) and purchase both a small storage bottle ( mine is 90 cubic inch) and a cheap electric pump. Things I liked: The gun is nice looking and feels solid in your hand. The trigger was easy to adjust and makes a lot of difference when squeezing off a shot. The adjustable cheek rest is a really nice add on and makes it comfortable and easy for head placement to get proper eye relief on the scope. Magazine is easy to load once, once I found the YouTube video that explained how to load one. Things I would have changed: I would change the dovetail mount to a Weaver/Picatinny mount. Seems the better scope have those style rings. What others should know: You may have to go through several different pellet weights and manufacturers to find the one your rifle likes. Mine really likes the JSB Exact Heavy 13,4. You may have to tune your rifle or have it tuned to get the best accuracy. I had to do this with mine and am still doing some fine tuning. From what I have read this is not uncommon. Things I liked: Accurate. Consistent on target shots. Things I would have changed: A bit heavy with the wood stock. I would trade it for a synthetic stock. What others should know: Using the supplied pump to get to 2700 lbs pressure is a workout. Things I would have changed: Sometimes I forget if I put a pellet in it (I'm an old geezer), and double load it. then I have to go get my cleaning rod and back the pellets out. Wish they had an indicator, anywhere, to show if a pellet was loaded, or just a little thing on the gun to flip, as a reminder. I take a folded piece of paper and place behind the trigger, if I have to dash off, once loaded, to avoid this situation. Hasn't happened since I started doing that. What others should know: It's heavy. If you're going to hold on a target for some time, you better be sitting down, or bracing this beast against something. I think the weight however contributes to it's ability to shoot such nice groups. I have a sand bag for target shooting, and a nice v brace on my tripod for more adjustment if needed. I shoot 2 clips, then top off to 3Kpsi again. My gun likes the Benjamin Discovery PCP pellets. Once in stock, I'm going to try the H&N copper coated, as they seem to get good reviews with this gun. I double load mine every now and then. Just pull the trigger and shoot them out. Actually killed a starling today at 30yds with a double load. Things I liked: Quiet, accurate, not too heavy. Love it.